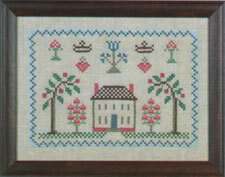 Home > Beginner > Antique Home 9" x 12"
This cross stitch printed sampler craft kit is a replica of an antique sampler adapted to a larger cross stitch. A stamped craft sampler kit that adds a flavor of various motifs to the scene. These Teaching Samplers were a great help in forming a young girl's love for the needlework lore.